Archive for the ‘Preschool Boredom Busters’ Category. Preschool Boredom Busters! My Mother’s Day Gift to You! I have compiled a list of Preschool Boredom Busters that I hope will be helpful to those of you who have little ones in your lives. 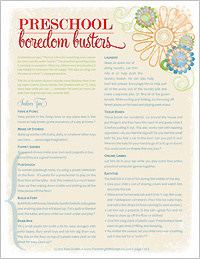 Click on the picture below (or go to the “Download” section of www.parentingwithscripture.com) and download/print four pages full of PWS Boredom Buster sample-topic pws_15_fab_verses_outlines1fun and easy ideas!